Welcome to Holiday Inn Los Angeles LAX Airport unlike any other! 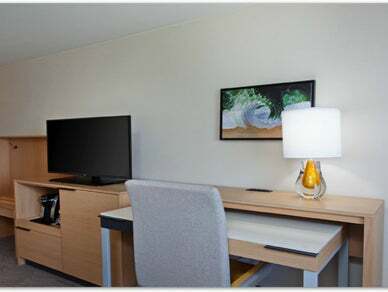 Uncover the Joy of Travel redesigned updated Holiday Inn LAX. Under our green sign, everyone is welcome. We are located 1 mile from LAX and just minutes away from local beaches. We offer complimentary shuttle service to LAX and Wi-Fi throughout the entire hotel. Impress with our new design as we are engaging in remarkable enhancements. Brand new style and sophisticated open concept to gather around and connect with ease. The Boulevard lobby offers private lounge areas, flexible workstations, and cheerful décor. Stay connected for work or play at “The Spot” E-Bar, offering a communal table with multiple connections, and private laptop chairs. Sip, Savor and Celebrate “Taste LA” enjoy the art of preparation, cooking and presentation, created masterfully by our Executive Chef. Need a quick bite, the newly added “Sip & Savor” coffee bar is the perfect grab and go option. Renewed guestrooms can be your retreat from an adventure. 9901 S. La Cienega Blvd.